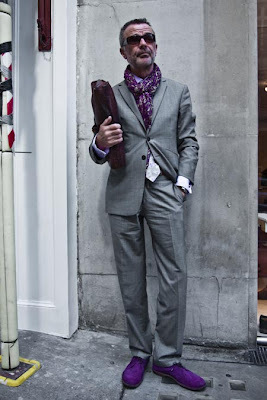 Some serious colour matching going on here, and whatever your tastes with the shoes and scarf, mid-grey does look great with purple. 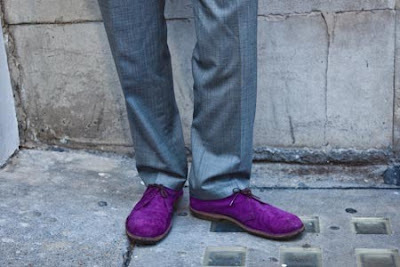 The gentleman pictured here and captured last week by our roving photographer is Michael Whitby-Grubb, who is launching a luxury shirting and accessories brand, Penrose London. The former Aquascutum international wholesale manager, Michael is starting the company with Duchamp founder Mitchell Jacobs. The debut range for Autumn 09 is a contemporary take on vintage elegance, with only subtle branding and colour palettes and the focus on subtle but luxurious woven patterns. More pointed Milan collars and higher London collars feature as well as a button or French cuff styles. You can follow the discussion on Matching purple with Michael Whitby-Grubb by entering your email address in the box below. You will then receive an email every time a new comment is added. These will also contain a link to a page where you can stop the alerts, and remove all of your related data from the site.